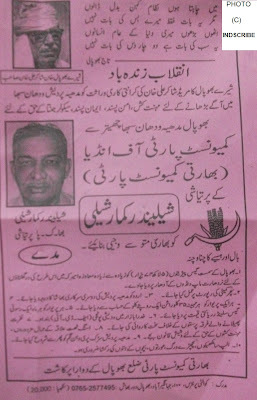 On the left is the photograph of the title of a recent issue of Urdu magazine for kids, 'Bachchon ki Dunia'. The front page has photo of fireworks with the line, 'Diwali Mubarak' written below it. The issue had come out when the festival was being celebrated. 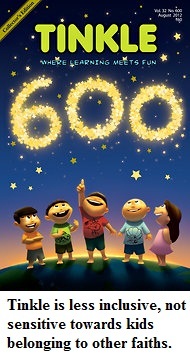 Inside, the editorial and other columns also informed children about the festival. There is also a long article about 'Sikhism', which tells children in lucid language about Sikhs, their gurus and the religion. The article is quite engaging and informative. An earlier issue had focused on Jainism. I am mentioning this because despite the fact that over 90% readership of the magazine is in Muslim households, they are sensitive enough and for this the editorial staff must be congratulated. Firstly, children must get information about the world. They should know the customs of other religious groups and people across the world. It is important to inculcate certain values among kids, especially, the respect for all religions and the message of communal amity and harmony. 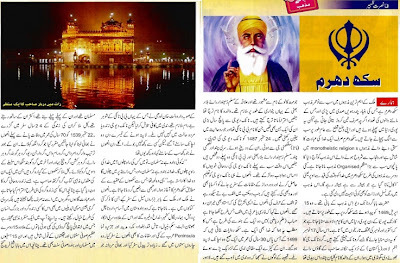 In the decade of seventies and eighties, it was common among certain Hindi magazines to carry stories during Id, Christmas or other festivals. Especially, Parag, under the editorship of Kanhaiyalal Nandan and Harikrishna Devsare, ensured that were at least a few stories or message for readers belonging to other communities during their festivals. On Id and Ramzan, there were such stories, that struck a chord with the readers. There were amazing stories that told reader about the message behind Ramzan and fasting. What you read in childhood has lasting impact on your mind. I read entire Hindu mythology in Chandamama and Nandan, which ignored other religions. Certain other magazines like Kukkut and Balbharti were often more accommodating. Today, there are many magazines in different languages. In English, magazines like Tinkle, Magicpot and Champak are quite popular. Tinkle's publishers were never known to be sensitive to this aspect. A small message or a short story adds variety to the magazine and also earns goodwill. Hope, the publishers of these magazines realise the need for being attentive towards all sections of the society. It just shows your maturity and sensitivity. These are just a few Urdu magazines lying on my study table. Among them, the four literary magazines include 'Shair' published from Mumbai, Rang-o-Bu from Hyderabad, Kitabnuma from Delhi, Abjad from Araria (Bihar) and Bebak from Malegaon. Also, visible are [non-literary] weekly Gawah and Span. In fact, for someone interested in literature, these are wonderful times in India. 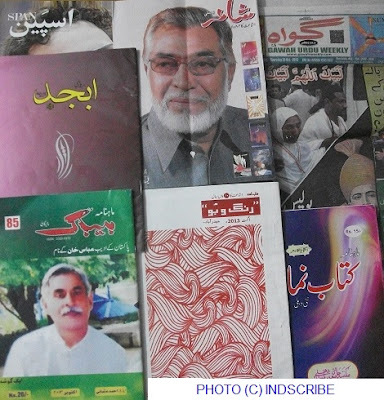 Right now, there are at least, 30 standard literary Urdu magazines. I am not talking about the non-literary magazines i.e. social, political, women's digests or other periodicals. I often hear people complaining about lack of magazines or fewer readers. The fact is that if you are interested, if you buy magazines, if you have a circle where people read, then you will have ample magazines and periodicals to satiate your literary thirst. But, if you aren't interested in reading, you will repeat he same old lines, 'where are the magazines, who reads these days?'. There are unique magazines like one that fits in your palm, and another which is too big that you need both hands to hold it. Now take a look at the other photo that shows another group of 'adabi' magazines. This has magazines like Imkan, which is published from Lucknow, Takmil [Mumbai], Zehn-e-Jadid [Delhi], Sabras [Hyderabad]. All these are magazines of high standard and are well-known across the Urdu speakers in India and also in Pakistan. In fact, I haven't talked about the main and most popular literary magazines in the language as yet. They are Ajkal, Aiwan-e-Urdu, Kitabnuma, Naya Daur, Urdu Dunia, Naya Waraq, Esbat, Sabaq-e-Urdu, Aamad, Intesab et al. The third photograph shows magazines that are equally important. Terhiri-e-Nau, Tarseel and Insha [Kolkata]. And I haven't mentioned the names of half of the literary magazines even now. There are dozens of Urdu magazines published from Delhi, Bihar, Maharashtra, Uttar Pradesh (UP), Jharkhand, Madhya Pradesh, even Gujarat and Haryana. The scene in Jammu and Kashmir, Karnataka and Orissa is also quite encouraging. 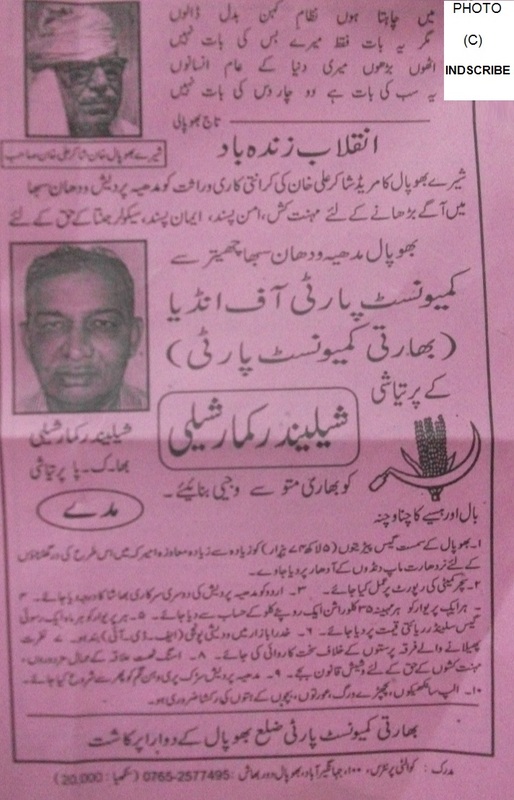 Also, the Urdu Academies in most states publish their own magazines too. Mind you, I am talking about just literary magazines. Compared to many other languages in India, the situation is much better in Urdu. 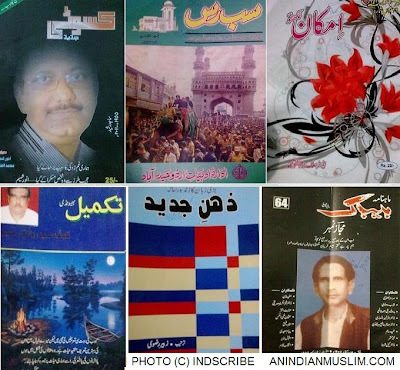 Doesn't the Urdu publishing scene rocks? Surely, it does. There is no question of any pessimism at all. 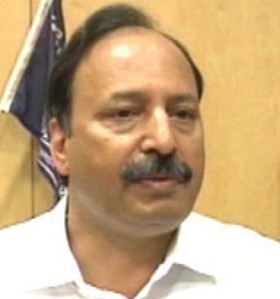 The brave police officer, Hemant Karkare, who headed the anti-terrorism squad (ATS) in Mumbai [Maharashtra], would have been 60 today. Unfortunately, five years ago, when terrorists from Pakistan launched an attack on Indian soil, Karkare, 55, and two other brave officials, Vijay Salaskar and Ashok Kamte, were killed. Karkare is remembered for investigating the role of right-wing radicals in terror attacks. From 2002-2003, there were many incidents when the police and intelligence agencies got clue that these extremists were involved. In many cases like blasts at Parbhani, Nanded and Purna, investigation slowed down after sometime and the perpetrators were not hunted. In Ajmer, Malegaon, Mecca Masjid [Hyderabad], Samjhauta Express attacks also, there were enough clues, but investigation was halted somehow or just the usual suspects were quizzed and made to 'confess'. It is not easy to look at the other side. Especially, when everyone expects you to just look at a particular angle. Then, there are forces--visible and invisible, which make attempts to thwart investigation when it gets 'uncomfortable'. It is also not easy to accuse members of organisations that are linked to one of the two big mainstream political parties in the country. 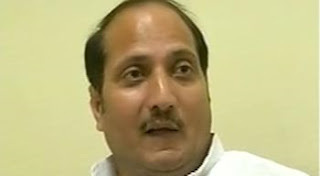 In certain states, due to political party in power, such probes were hushed up. Mostly, officers who seemed 'enthusiastic' got the message through different ways. In Maharashtra, KP Raghuvanshi earlier headed the ATS. But after Karkare-led ATS cracked the Malegaon case, it exposed a lot of groups and people. Not just the seven above-mentioned cases, but similar incidents including blasts or foiled bids in Modasa, Kanpur, Bhopal, Goa or explosions at cinema halls in Vashi, Panvel, Thane [Mumbai] and Nagraj Jambagi's module in Karnataka, were seen with a fresh eye. Officers who didn't dare to venture into this territory, were now looking into possibility of the 'other side'. In fact, the list is quite long. Cases in which Hindutva-linked organisation's role came to fore, number more than a dozen. But after Pakistani terrorists entered India and the brave officers were killed, the investigation in different cases suffered.Pragya Thakur and his group had been nailed by then. But the nexus of the men in uniform and many other similar cases were not investigated later on. It took barely four years, and the popular narrative became similar to what it was before 2008. Once again, probe in every blast turned to single direction.No denying the role of Muslim extremists in terrorist acts in India. But the possibility that in a case, there can be a different angle--Left-wing [Naxals] or Right-wing, is just not given a thought. In many cases, there were leads but they were not considered at all. The role of a section of media has been questionable. [Link to a recent report in Caravan magazine]. Blasts near Koodankulam nuclear plant were just not considered big news. 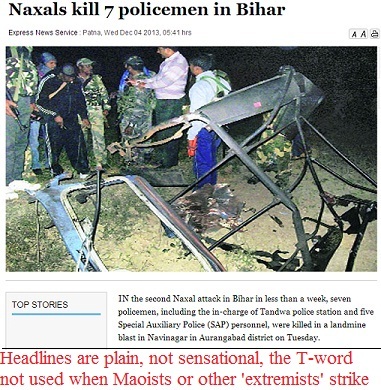 Killing of over 50 politicians and policemen in a single strike by Maoists in Chhattisgarh this year was not termed 'terror attack'. The one-sided reporting goes on along with linking Muslims with the word Terror. No wonder, Hemant Karkare is remembered and loved by large section of the society, because he dared to tread the path, few take. He was criticised and even got threats. There have been many decorated officials in Indian Police Service (IPS) before him and after him. But none like him. The slain made the force proud. He will always be remembered for his impartiality and fair investigation. 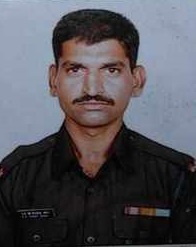 A martyr, he duly got the Ashok Chakra. A big salute to him on his 60th birthday. BJP's landslide victory in Madhya Pradesh is more surprising because Shivraj Singh Chouhan led the party to victory after two successive terms. In Rajasthan, BJP was out of power. In Chhattisgarh also, the BJP has got the third term but the victory is not as one-sided. In MP, the win is important because after ten years of BJP rule, the party managed to override the anti-incumbency factor. It is a fact that Chouhan, who belongs to the backward Kirar community (OBC), has established a connect with electorate in the state. Chouhan is soft-spoken and humble unlike many other politicians. Also, people from outside Madhya Pradesh find it surprising that he is quite popular among of Muslims. The constituency wise analysis clearly shows that Muslim mohallas have also voted for BJP across the state. BJP legislators in Bhopal and several other Muslim majority areas, know it well, and hence they don't rake up controversial issues anymore. In fact, either it is BJP leaders like Vishwas Sarang or district president and legislator Surendra Nath Singh, they have strong Muslim support. Their close associates are Muslims too. For Muslims in other parts of the country, who still think that it is a taboo to get close to BJP, this is strange phenomenon. Poor get benefited as the expenditure is borne by administration, and the newly wedded couples get cash apart from utensils and other basic utility gift items. The Ladli Laxmi scheme is aimed all the girls across the state. This scheme has also brought him enormous goodwill. No wonder, there can be anger with party or MLAs but move around the state and nobody would criticise the Chief Minister. 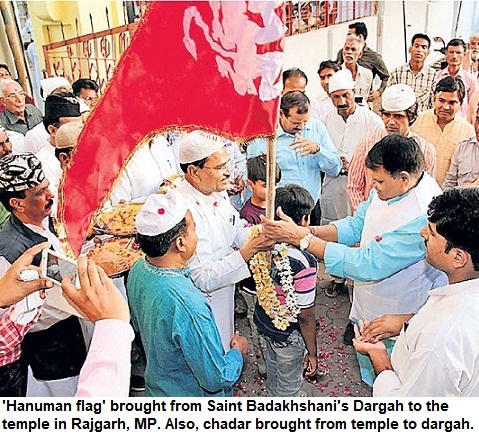 While Hindus from all the districts are sent to pilgrimages on government money, elderly Muslims also go to Ajmer under the MP government scheme. Not just Congress leaders but other politicians can also learn a lot from Shivraj's soft-spoken, humble style. There is no arrogance and this is in sharp contrast with the other politicians. One of the most important reason is that communal violence is tackled with an iron-hand. Muslims appreciate how he has dealt with communal elements, especially, in the second tenure. All IGs, SPs know that CM doesn't want any communal trouble. In case there is a riot-like situation developing, force from neighbouring districts is rushed to control it. It is a fact that if government is tough and CS-DGP know it well, then everybody from top to the bottom, speak the same language. Hence, communal violence has been rare and if it occurred, then it was controlled in the beginning. Congress ruled Assam saw large-scale riots sometime back. Rajasthan witnessed the Gopalgarh killings* and numerous other incidents of communal tension. Instead, the Gehlot government didn't take swift action. Tainted officers including policemen who fired without provocation were let off easily. In the 'secular' Samajwadi Party (SP) government's rule in Uttar Pradesh (UP), over a dozen riots have taken place in less than two years. The handling of the Muzaffarnagar riots has has alarmed the Muslims across the country. The SP government appeared trying to hush up the entire issue. From forcing the people to vacate camps to not registering FIRs of the victims, the people are witness how riots have been occurring repeatedly and yet parties that claim to be pro-Muslim, fail on this front. 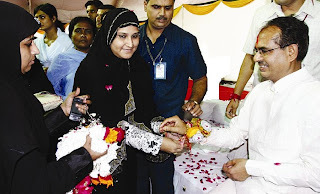 Yes, Shivraj has no issue wearing a 'skullcap' (topi) or going to Idgah to greet Muslims on the occasion of Eid or holding 'iftaar' during Razman at his residence. An alumnus of Bhopal's Hamidia College, Shivraj has his own brand of inclusive politics. On Raksha Bandhan, when large number of 'burqa'-clad women reach CM House to tie rakhi on his wrist, it is not just for the sake of photograph or publicity. It is not that the BJP has changed totally. But the administration isn't overtly communal. 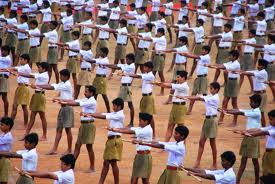 Rashtriya Swayamsevak Sangh (RSS) is very much in control. Despite his image of being fair towards minorities, the State government may time and again push for implementing the Sangh's agenda. It is natural. It happened in the past. If the protests are huge, then there is a rollback. Else, certain things are implemented silently. But the MP experiment shows, that it doesn't take much to keep Muslims in good humour. 'Riot-free' is the recipe along with a basic good governance with no open bias or discrimination. On the other hand, there are parties that do nothing for Muslims, can't even stop riots, and yet, get the tag of 'appeasing minorities'. Of course, there is other side too. 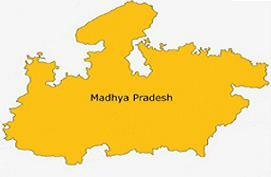 Corruption is rampant in Madhya Pradesh. The investment didn't come. Roads are slightly better than they were during Digvijay Singh's rule. But employment hasn't been generated. In fact, there are shortcomings and a lot to disagree with. This blog has quite often been critical of BJP [Congress as well]. The good steps must be appreciated. When there is such a massive mandate, it means the citizens are happy with the government. Chouhan presented himself as a 'common man' and hence, he been rewarded. No wonder, the positive aspects should be highlighted too. *In Rajasthan, Muslims were so disgusted with Congress' leadership and its attitude in the aftermath of Gopalgarh killings that they heavily voted for BSP, BJP. Read senior journalist Iftikhar Gilani's report. It is unbelievable but true. At least, ten major acts of terrorism occurred recently that were either ignored or hushed up in media. At the end of this post, there is a list of all these incidents. None of them were carried prominently in newspapers and TV channels. Forget, hours of debates in studios or follow-ups for days in print media, some of these cases were not considered to be worth a 'flash' in Electronic media. It is not just about news from North East getting neglected. Some of these incidents occurred in big states like Maharashtra, Bihar, Tamil Nadu and Chhattisgarh. In fact, one of the incident was near Chief Minister's bungalow. But did you even see a 'ticker' on your TV screen? Six persons were killed in blasts near Nuclear plant at Koodankulam. Imagine, what can be bigger in terms of threat to national security? But it failed to interest TV channels. Papers didn't carry it on Page 1. Further, more explosives were found during the search later. But there was attempt to even report this news. For a country that has witnessed horrors of an industrial disaster like Bhopal gas tragedy, it was surely very serious. But the few papers that carried news on inside pages, diluted by terming bombs as 'low-intensity' even though six persons had been killed. Often incidents in which no one has died is termed 'terror attack' but these incidents were not dubbed as 'aatanki hamla'. In the reports in newspapers, the words were carefully chosen. Often words like 'militant' were also missing. Instead, one could find 'rebel' or 'insurgent'. In sharp contrast, there are incidents, when even 'suspected persons' were arrested for a possible crime, but they were termed Terrorist. Why? Just because in these cases, none of the extremist outfit had any Muslim connection? These are double standards in media that are really worrying. Unfortunately, other incidents in which a Muslim person is either involved or suspected to be involved, are repeated for day. There is immense speculative reporting, followups and so much coverage--real and imaginary about links of suspects, that it creates scare in the mid of citizens. No wonder, the image of one community is affected badly. Propaganda does a lot of harm. It injects hate in society. The majority of the people form their opinion on the basis of what they see. All terror acts must evoke similar reaction, should be treated with the same contempt and stern action. There should not be any differentiation in reporting on 'blasts'. But this practice of not calling an incident as 'terror' and not the other even if the magnitude of latter is similar or higher, is unfortunate. The stereotype of a particular group or section being terrorist is reinforced. 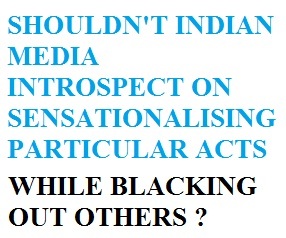 Can our media introspect? Will citizens realise it? If an incident is repeated for days on TV and a scare is created, [while others hushed up] then it is also wrong. It helps the terrorists as their aim is always to divide society and create panic. Unfortunately, the politicians-executive-courts-activists haven't taken note of these dubious practices in Indian journalism. What gets reported is seen and is believed. When other destructive acts are diluted, hushed up or ignored, then in public perception is clearly being manipulated--knowing or unknowingly, I don't know. BJP leader Narendra Modi was recently in Karnataka as part of his ongoing nationwide tours to address rallies in different parts of the country. No doubt, there was enthusiasm among Modi's fans in Bangalore [now Bengaluru]. He does have a strong support among sections of the society. Definitely, as a Prime Minister [PM] aspirant, he should get the due coverage. But surprisingly, TV channels and newspapers turned a blind eye towards the demonstrations against him. These protests were also quite colourful. Some people had dressed in black as a mark of protest and some others had placards in their hands with messages in English [ like Modi, Go Back] and Kannada. While his rally was reported at length in print and electronic media, the dozen odd groups and organisations ranging from farmers to Dalits, communists to Karnataka's local organisations, which held the demonstrations, were not shown at all. That's not fair journalism. Ignoring protesters who are against Narendra Modi's politics or BJP, should have been given a few seconds in the TV coverage. Even just a photo or a single column news in English or vernacular newspapers would have shown that journalists are showing both sides. But this near total blackout raises serious questions. Its not healthy for our society either. Fortunately, among the 25-30 channels, there are still one or two which show the OTHER SIDE. Else, we don't get the view of those who are NOT IN LINE. I must say that there were lakhs at the venue to hear Modi speak. But the hundreds or few thousands with an alternative voice should also be heard and seen. There was nothing in the news on the particular day about these protests. I waited, even the next day, nothing came out in print or on TV. Journalists shouldn't take sides. They should report things and present both the sides of the picture. Already, there are disturbing reports about how owners in certain TV channels have told their employers to stop doing 'critical stories' about Modi. At a recent rally in another state capital, the attendance was thin. Barely, 10% of the ground was full. Still, TV cameras just focused on the portion that had crowd. It was Narendra Modi rally and hence they didn't apparently want to show the lack of crowd. Why? Isn't that a news? The next day some journalists did write about it on blogs and papers. But it was strange to see how cameramen didn't focus on the empty ground or talking about just 5,000-7,000 participants in the public meeting. There is also clear instruction in this regard to Editorial staff in certain major TV channels. If Indian citizens want to vote for him, they will surely do this. But media mustn't lose its objectivity. If there is a wave, it will be visible. Journalists don't need to create it or stop reporting the opposing views. That's why media is considered a pillar of democracy. Isn't it? In my childhood, election season was special. The campaigns were boisterous and colourful. Loud speakers blared throughout the day and scores of vehicles were hired by every candidate. The jeeps engaged in campaign would throw pamphlets. The children would run after these vehicles and often got parties' badges and symbols. But the high-decibel campaigns are now history. In the post-TN Seshan era, the Election Commission (EC) managed to rein in the parties. The huge expenses were brought under control. It was indeed a positive step. But yes, sometimes, one looks back and recalls how colourful elections were in those days. In fact, in the recently concluded election, there was such lacklustre campaign that sometime even residents were not sure about the candidates. While most of the people were aware of the Congress and BJP candidates due to newspapers or their hoardings, not much was known about who else was in the fray [independents, smaller parties]. There were few banners and posters. Contestants were also worried about EC and were over-cautious. They feared that if they were found guilty of higher expenses, then the EC would crack the whip. Nobody wanted trouble when the model code of conduct is in effect. Officials keep record of all expenses. Recently, a journalist asked an EC official at a press conference about the 'dull and silent campaign'. The officer said, "Do you like that you wake up in the morning and find your wall painted with a political party's symbol?' The man who posed the question, had nothing to say now. True, there was huge money involved earlier. Even booths were captured in those days. Now there is enough force deployed that criminal elements and other trouble-makers are restrained. Even though the campaign wasn't too loud, there were banners and posters on prominent places and on road sides. 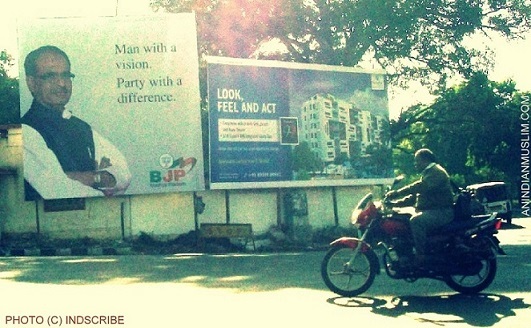 Surprisingly, the BJP even campaigned in English. This is the first occasion when in North India, [at least in this region], we saw any mainstream party using English in its 'chunav prachar' [election campaign in English, intekhabi tash'heer, in Urdu]. Shivraj Singh Chouhan was portrayed as a man with vision, BJP as party with the difference. 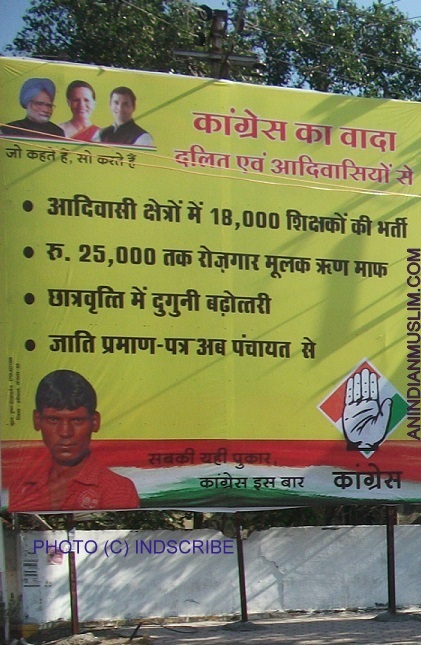 Congress listed its own achievements and made promises, as you can see in this billboard in Hindi. It says what the party has done for Dalits [Scheduled Castes (SCs)] and the Tribals [Scheduled Tribes (STs)]. Other parties were not visible much. A Communist Party of India's (CPI) candidate Shailendra Shaili's poll campaign begins with a famous poet's couplet. The Communist party candidate who is more active on the ground, has campaigned extensively in Urdu. Starting with 35 kg ration for every family at a rate of 1 Rupee per kg, it goes a long way in terms of promises. The CPI contestant wants Urdu given status of a second official language of the state and taking stern action against communal elements. There is also a lot about the steps to be taken to improve financial condition of labourers, implementation of Sachar panel report et al. Now the elections are over. The candidates are resting and the fate is now sealed in the Electronic Voting Machines (EVMs). All eyes are now on counting, which will take place a few days later. Then, after a few months, we will all see the campaign for the general elections [Parliamentary polls]. Let's see, how goes the campaigns of political parties then. BJP honours Muzaffarnagar riot-tainted leaders: Should a national party stoop so low? For a party that has ruled India, and aspires to rule it once again, it was definitely a cheap act. Felicitating the party MLAs who are facing charges of incitement during Muzaffarnagar riots, doesn't behove a forward looking national party. But the Bharatiya Janata Party (BJP) has just done the indefensible. The Congress, BJP CPM, BSP are all different parties because their ideologies are different. It is understandable. But when a party openly felicitates such politicians, it doesn't set a good example. The BJP wants to position itself as India's party for the future. Such actions won't help the BJP. Perhaps, it may get a few extra votes through polarisation in the region through its appeasement of the rogue and fanatic right-wing elements. But in process it has lost much more. Though there was criticism, the party went ahead with its plan. It was immoral, indecent and unbecoming of a 'responsible' party to act in such a manner. 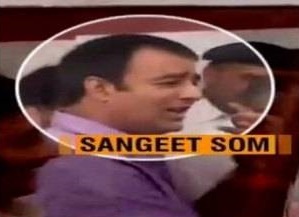 The MLAs--Sangeet Som and Suresh Rana, were garlanded. They were presented the traditional head gears and were felicitated. Som is accused of fanning communal hatred through internet by uploading a fake video [belonging to another country]. Even after the arrest, one of the legislators was accused of updating his Facebook page from jail, and putting up objectionable material. A complaint in this regard has also been filed with the police. How can the party take moral high ground over Congress or any other party. Time and again BJP attempts to take the proper CENTRE-OF-RIGHT position but then it again drifts towards the LOONY RIGHT wing. Indeed, the party crossed the laxman rekha. It is lucky though in the sense that media hasn't been too harsh over the party over it. Halwa-Paratha: Have you eaten this mouth-watering Indian delicacy? Halwa-paratha is a unique dish. You find it at most Indian mela(s) [fairs]. I am sure after seeing the photograph, you would also be tempted to try it. As you can see in this photograph, the halwa is mouth-watering. It is sold mostly in makeshift shops on the roadsides. Its sweet thought not excessively and melts in your mouth. The halwa is garnished and its a delight to see it. The huge paratha that accompanies it is also quite tasty. The halwa-paratha is a desi dish and hence comes quite cheap. 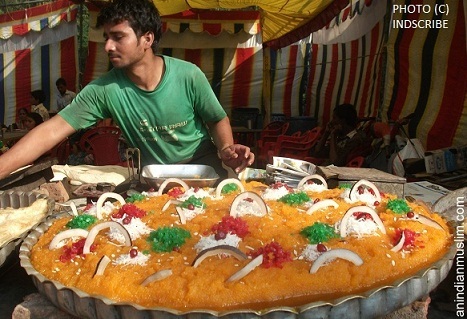 For Rs 30-50, you can get enough halwa along with a piece of the Paratha. It tastes great at the shop, when its hot. Some people prefer only the Paratha, which also has a taste different from the traditional paratha. In fact, the way they are made, you can call them 'giant puris'. In my childhood, I visited a fair on a regular basis with my cousin brother. I enjoyed the visits all the more because as he was fond of paratha, I got to eat most of the halwa, without having to share that with him. Apart from fairs, it is also sold in specific periods during the year. 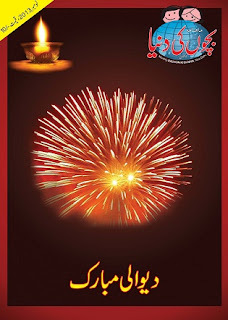 For example, during Shab-e-Barat, Milad-un-Nabi or Id, you may find it in the Muslim localities. Also, there are high chances that if a Sufi Saint's Urs is being held, there would be the halwa-paratha shop in the vicinity. Earlier also, I had written a post about Indian Fairs and the food at these mela-thelas. You can read it HERE. 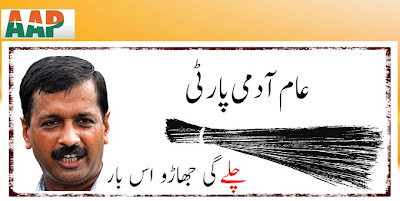 Shouldn't Muslims support Aam Aadmi Party (AAP), try it once? The Assembly elections are round the corner and recent poll surveys suggested that Arvind Kejriwal's Aam Aadmi Praty (AAP) was now a serious contender in Delhi. Though the AAP doesn't have a major presence in other states, success in Delhi, will boost the morale of the party. In in the initial period [post Anna movement], there wasn't much enthusiasm among Muslims, regarding the AAP. It seems the mood is changing now. Finally, a lot of Muslims are now talking positively about the party. AAP has certainly made a difference in the way campaigns were conducted in Delhi in the past. Also, the party leaders seem to be more open and clean. It will be a positive change if Muslims see an alternative in AAP. For decades, Muslims supported Congress and what have they got in return? The Sachar panel report revealed the truth about Muslims' socio-economic backwardness. But, years after the recommendations, what has the Congress done about it? Similarly, there is no implementation of reports on communal riots. Still, Congress acts in such a way that BJP manages to get the arsenal to attack Muslims, and term it as a party that indulges in 'appeasement' Muslims. The trouble with BJP is that it says that its different but its cadre & members of its allied organisations have no love lost for the minorities. If there is genuine issue of Muslim youths framed or innocent youths booked under harsh laws, the BJP leaders don't even pause and think once but straight want even harsh treatment. Okay, don't 'appease', but at least, avoid targeting or harassing the minorities. Can the BJP do it on a national level? They are torn between their ideology and the needs of the politics. This differs state to state, leader to leader, CM to CM. So what's the option? The ordinary Muslim, just like the ordinary Indian, expects little from politicians. What we want is that they won't rob our money, avoid scams, stay away from hooliganism, extortion and work for ensuring transparency in the system. Even basic demands like improving condition of Urdu medium schools in Delhi or opening dispensaries, ensuring hygienic drinking water & electricity, fell on deaf ears. So, it is understandable that there are murmurs for change among Muslims. The fact that there are just two big mainstream parties at the national level--Congress and BJP. Both these parties refuse to change, fail to reinvent and many of their leaders have institutionalised corruption. Isn't this reason enough for electorate to support a third alternative. In the beginning, there were also reservations among some sections about AAP's stand on certain issues like AAP's stand vis-a-vis reservations for Dalits/SCs/STs. Some persons with dubious credentials are no longer with the party. Hopefully, with party growing in strength, its leaders will make their stand clearer. If sections of Muslims switch to AAP's fold, it can surely change the complexion of Assembly in Delhi. No group, community or individual should become a slave to any party. There should not be any compulsion to keep voting for a party election after election. The political system has become stagnant and hence the entry of the men with the broom [AAP's election symbol], might just make our democracy more vibrant. Also, arrival of new party, forces the existing political parties to introspect and improve their functioning as well. In this context, one should welcome the party's presence on the election scene. 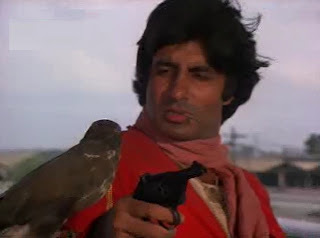 Thirty years ago Amitabh Bachchan had got critically injured while shooting for his movie Coolie. For months he remained in hospital and there were prayers across the country. It was a miracle that he survived. I still remember the period as newspapers daily published reports about his condition. In that era, even the children's magazines that rarely dwelt on films, printed special issues with the superstar's photograph on the front pages. Coolie was released in 1983 [Bachchan was injured in mid-1982]. I was a kid when I saw it. I remembered a few scenes and nothing more. In fact, I couldn't even recall the story line. Recently, I again got to see the movie--after a gap of 30 years. It was a typical formula film of the era. It was still the pre-liberalisation era, when the hero was not a 'Raj Malhotra', who is son of business tycoon. Today it is unimaginable to have a coolie as a hero in our movies. But this is also a fact that the story line used to be too fantastic. Perhaps, it was Amitabh's magic, his persona, that he could carry such roles, where the movie absolutely revolved around him. The criminal, Zafar, comes out of jail and find that the woman, Salma, he wanted to marry, is wedded to one, Aslam Khan. Zafar forcibly takes her away, in process letting dam water flood the locality. Everyone is marooned in process. Salma who has lost her memory, goes with Zafar [role played by Kader Khan]. 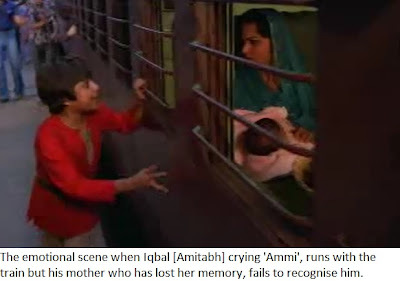 Her son Iqbal [Amitabh Bachchan] is also separated from her mother and father. He grows up on the railway station, working as a porter [coolie]. It was the formula of the seventies and the eighties. The Angry Young Man grows up with his Hindu uncle, offers Namaz and also leads the Ganpati procession. There is romance, songs and drama. Also, comedy scenes like making the omelette while hearing recipe on radio. Rati Agnihotri keeps swapping radio stations--one airing yoga and the other omelette recipe. 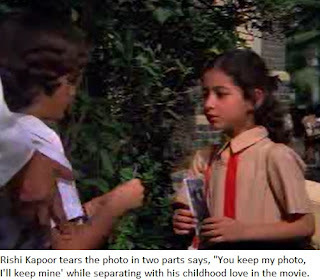 Like many other movies of the era, Rishi Kapoor is here the side hero, playing the role of a photographer-journalist. A typical Manmohan Desai movie, it has all the ingredients of the old Mumbai movies. The 'baaz' [falcon] comes from nowhere every time to save Iqbal or his uncle or the side hero. There is emphasis on religious identities and the communal harmony among the Hindu-Muslim-Christian characters. Then, the Coolie's badge, 786, which protects him. Divine intervention also comes when it is needed the most. 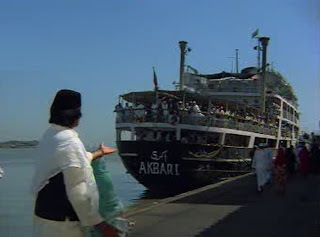 From the wish to go to Ajmer, the famous song 'Mubarak ho tumko haj ka mahina...'while the ship taking pilgrims goes for Haj and the green chadar that saves Iqbal, there is a lot of stuff. Today we call it the 'old formula' but in those days, it worked wonders. A potpourri of all emotions, everything went well at the end. People getting united because of a tattoo or an old photograph. The movie stops when the scene when Amitabh had got injured, comes on the screen. Coolie is a kind of a 'Muslim social' though it is not counted in this genre, as it was basically a masala movie. Quite a long movie, it represents an era in the Bollywood movies. Critically you can find faults with a lot but this sort of movie can't be made anywhere else, except India. 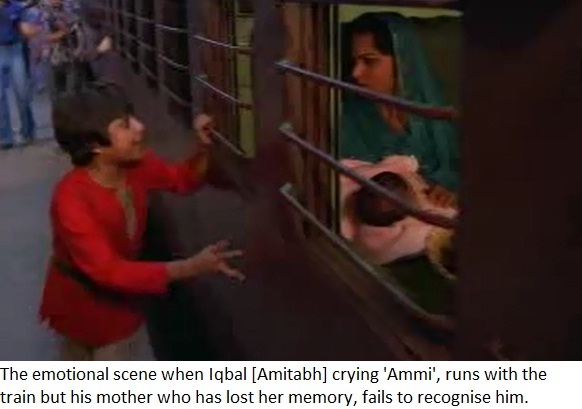 Here lies the uniqueness of Indian cinema. After a long time, I have rediscovered my interest in movies. Hence, a few more posts may be in the offing on this blog in near future. RSS wants Hindus to have more children: Shouldn't Sangh leaders take up real issues like female foeticide rather than perpetuating old myths? Once again the Rashtriya Swayamsewak Sangh [RSS] has urged Hindus that more children should be produced, in order to check the demographic imbalance. Did anyone call it fatwa or a diktat? How many TV channels found RSS joint secretary Dattatreya Hosbale's comments as controversial? Has there been strong criticism on editorial pages in mainstream newspapers? This is not the first time that RSS leaders have said that Hindus need to produce more kids. For them, Hindus are the 'victim'. The bogey of 'Muslim population rise' or 'Ham Panch-Hamare Pachchis' are used by RSS to portray Muslims in bad light. Not only that the statement aims at driving wedge among religious communities, the fact is that it is truly regressive in nature. Shouldn't RSS turn itself into a forward looking organisation? The reason is that if RSS been a forward looking organisation, it would stop looking at things from the Hindu Vs Muslim. In that case it should have urged middle-class Indians [mostly Hindus] to stop female foeticide [and infanticide] to control the fascination for 'baby boy'. It is this gender imbalance that is really threatening Hinduism [and India]. There are vast regions where there are less than 800 girls for 1,000 boys. Even the upper class and middle-class want the 'baby boy'. If the first child is a girl, many go for second, in the hope to have a boy. This 'sickness' needs to be fought. Strangely, RSS leaders never tell their followers how Hinduism has been growing much faster over the last century in the world. While Islam has grown fast after 1900, overall population of Hindus in the world, has also gone up significantly, even as Christianity and other religions have now lost the pace. As far as rise in Muslim population in India is concerned, it is not a very unusual phenomenon. The minority [Muslim] rate of growth is quite close to Dalits. Clearly, economic reasons and social backwardness are the cause behind the high birthrate. In states like Tamil Nadu and Kerala, Muslims have a growth rate of much less than 20% per decade, which is less than the growth rate of Hindu population in India in many other states of North India. UP and Bihar have overall bigger families. No wonder, fertility rates are higher among Muslims in these states. Secondly, there is no open opposition to family planning among Muslims, and they have adopted it widely. As Muslims go up on socio-economic indicators, they also tend to have smaller families, just like rest of the Indians. As per 2001 census, the overall population grew by 21.5% in India in the previous decade. Muslim decadal population grew by a mere 13.7% in Tamil Nadu and 15.8% in Kerala [from 1991 to 2001]. These states have a higher Muslim literacy rate and here Muslims are financially better-off. In contrast, Hindu population increased by 28.7% in Punjab, 24.7% in Karnataka and 23.4% in Bihar. How do you explain that? Now there will be critics who would say that if Muslims grew by 13.7% in Tamil Nadu in the decade, the decennial Hindu growth was just 11%. The problem is that when the Hindu growth rate is seen, they don't take into account the growth rate of backwards and Dalits, whose population growth is comparable to Muslims. For example, you can't expect to compare Iyers or Iyengars' decadal rise in population with Dalits or even Vanniyars. If you have to at all compare then do it with the socially upward Muslims. Else, consider Muslims also as a social group and then look at them with their growth rate. The right comparison would be Muslim population rise vis-a-vis increase in population of social groups that have similar earning, living conditions and socio-economic backwardness.Statistics clearly reveal that Muslim population rate is falling in India and would stabilise in a few decades. The difference of population growth rates is narrowing down fast. Far from becoming majority or even 25%, it will take centuries before they even reach the figure of 20% in India. For decades, right-wing groups have made similar claims. Take for example, the charge of polygamy. Census clearly reveals that the practice of polygamy was highest among Adivasis, Jains, Buddhists and Hindus. Muslims came last as far as prevalence of the practice was concerned. See LINK and LINK. This is despite the fact that polygamy is legal for Muslims and unlawful for Hindus. But this is not highlighted or even mentioned. Tell a lie a thousand times and people tend to believe it. Senior RSS and BJP leaders often make attacks on Muslims about being more polygamous. In December 2005, the then RSS chief [sarsanghchalak] KS Sudharshan had also urged the majority community in a similar manner. He said that 3-4 children per couple would keep the 'changing religious demography' in control. Just imagine had any other religious community [like a Muslim cleric from Nadwatul Ulema or Deoband] made such a statement, what would have happened? There would have been wide condemnation, politicians and activists gunning for him and effigies burnt. TV channels would have continued debates for days. But in the case of RSS, it was simply ignored even though the 'cultural organisation' has huge impact and has a cadre strength of tens of lakhs. If the RSS leaders take up real issues that affect the nation, they would be taken more seriously. It may also strike chord with the young generation. However, they remain stuck in regressive rhetoric. Sangh also needs to look at itself. Shouldn't the swayam-sevaks [volunteers] shun celibacy and marry, in order to increase the numbers of Hindus? Though its their personal issue but I wrote about it as they often find faults with Muslims. Mustn't they also take the blame? Had the RSS workers for several generations [who have been observing celibacy] married and had families, then there would have been lakhs of more Hindus. Rahul Gandhi's statement on Muzaffarnagar riot: Will he speak about Congress inaction on implementing Sri Krishna Commission report on Mumbai riots? It was realy shocking to read about Rahul Gandhi's speech and his 'revelations' regarding Muzaffarnagar riots in the political rally at Indore. Already, other aspects about his speech have come under criticism. But I am especially amazed as it comes from the man whose party has failed to act on the recommendations of Sri Krishna Commission panel which conducted probe in one of the worst communal riots that occurred in Mumbai in 1992-93. Congress was the ruling party in Maharashtra then. For 20 years, victims have waited for justice and successive CONGRESS governments in Maharashtra, that promise implementing the report every time before election, have not acted on the promises. Rahul Gandhi hasn't spoken a word about the conduct of Congress-NCP led state government. It was under Congress chief minister Sudhakar Rao Nai, that two separate rounds of rioting had led to nearly 2,000 deaths in Mumbai, which was known as Bombay then. For those who felt that Rahul wants to change things for good and is in favour of clean politics, this speech his come as a letdown. Those accused of rioting, particularly, the policemen were not prosecuted. The personel who fired at innocents were saved at every step. Still, successive Chief Ministers from Vilas Rao Deshmukh to Prithvi Raj Chouhan haven't shown any interest in implementing the Justice Sri Krishna Report. How does Congress has the cheek to talk about riots and justice! Firstly, don't promise if it is not your intent to act. During previous elections Congress leaders have been promising that they would do implement the report once they come to power. Accusations of framing Muslims in false cases in Maharashtra, are well-known. The state has one of the largest number of Muslims in prison. Has he ever voiced his concern about it? Given his hold over the party, he could have got it done easily. Just a few days back, he had 'torn the bill' on convicted politicians and this ensured that Rashid Masood and Lalu Yadav have lost their Lok Sabha seats. Why don't we see such a step from him over riots? Instead, there is just hurtful rhetoric. Secondly, the speech was objectionable, as he made a remark linking Muzaffarnagar riot victims with Pakistan. Either he doesn't understand Indian Muslims at all or he has strange people around him on whose inputs, he made this weird statement. As an Indian Muslim, I strongly object to the community being used as a tool to settle political scores. Further, by suggesting the possibility of neighbouring country's agencies trying to poach riot victims, he linked 'Indian Muslims' with "Pakistan', something that really hurts. Intelligence guys may imagine things or even make guesses as it is part of their job. Once an intelligence officer had even made a foolish comment that he 'heard' that Muslims in Hyderabad, put up photograph of Pakistani leader in their homes. He later accepted that he hadn't gone to any such house or seen such a photo. People can say utterly foolish things but should Rahul Gandhi use them to strengthen old stereotypes? It was insensitive as for decades after independence, Muslims heard barbs and accusations about their being 'fifth columnists'. This had almost come to an end now. Indian Muslims can't be used by any outside power against their motherland. Any such suggestion is objectionable, howsoever, we suffer. I really don't understand if he is immature or plain naive to believe anything he gets to hear and then accepts it as Gospel truth. Of course, to say it publicly is also wrong. Knowingly or unknowingly he ventured into something which Indian Muslims really detest. Barely a week ago, an Indian Muslim army-man laid down his life on the border. He had been sanctioned leave but decided to stay back because of firing at LoC, and achieved martyrdom. If you can't take the name of martyr Lance Naik Feroz Khan, then please don't talk about this imaginary possibility either. Till a few decades back, we often heard certain members of the right-wing parties drawing these parallels but when Rahul Gandhi says something like that, then there is surely something seriously wrong with the Congress. Dr Vizarat Rasool Khan, who passed away in his native, Hyderabad, was a leading educationist and visionary who championed the cause of education among Muslims. The news of his death caused grief across the country, especially, among Muslim circles. In Urdu newspapers, he was termed as Sir Syed of Hyderabad. His contribution was immense, as he dreamt big and managed to achieve the goals. Khan built 56 educational institutes that include 24 engineering colleges and two medical colleges. He also set up the first ever women's medical college in India, apart from women's engineering college. Further, he was at the forefront for the fight to ensure that Muslims from the poor section get higher education, at a highly subsidised* rate. A social-worker who also dabbed in politics and got elected as an MLA, his focus throughout remained on education. In fact, the achievements of the Khan's Shadan Group are remarkable. Those not familiar with the bureaucratic setup, feel that it is easy to establish colleges or institutions. The truth is that Herculean fights and lifelong efforts were needed, as State governments don't give permissions for setting up of Minority Colleges. The files just don't move. The real issue is the indifference in bureaucracy towards any such proposal. Further, there are obstacles at every juncture. 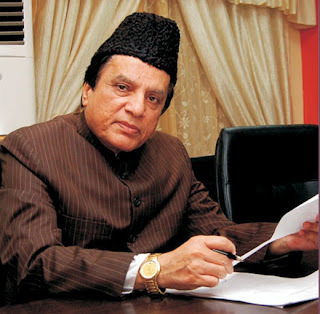 In his interview with Shaik Ahmed Ali's Urdu news channel, INN LIVE, Khan said that he want government to facilitate setting up of educational institutes and give nod. Once the government nod and the no-objection certificate [NOC] was there, such standards would be maintained that AICTE or MCI norms could be fulfilled. The problem is always in dealing with the slow-paced bureaucracy. Building the dozens of colleges and a 750 bed hospital is an accomplishment in itself. Just recently Dr Khan had come out of hospital but had to be admitted again recently. Khan was nearly 67. He died after prolonged illness. However, in his lifetime, Vizarath Rasool Khan has done what few manage to do. 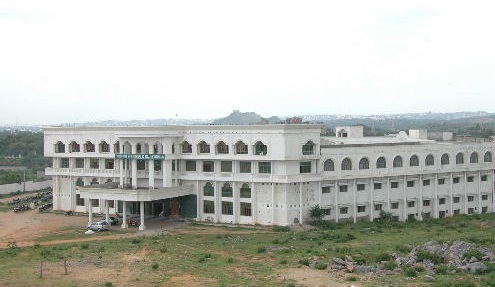 After the Deccan College [Khan was part of the team behind it as well], his was the second minority Engineering College in Hyderabad, after parting ways with the Deccan. Since then, there was no one stopping him. Professional colleges were set up one after the other and finally it led to medical colleges and hospital. Still, Khan was not satisfied. He was trying hard to establish an autonomous university. He felt that there was no dearth of talent among the poor but they didn't have resources. There is need for more colleges, so that the students from unprivileged sections could get in, and there is need for financial assistance and good scholarships. Clearly, Indian Muslims need more revolutionaries in the field of education like him. Apart from being the head of Shadan Group of Educational Institutions, he was socially active and regularly coordinated with other activists, academicians and politicians for improvement in the educational scenario in Andhra Pradesh. Today he has left behind the modern schools, colleges for girls and boys, institutes for professional studies in law, management, B Ed, technical sciences et al. In fact, he built the largest network of educational institutions for Muslims. Many other colleges including dental and medical colleges are awaiting government nod. He managed to achieve all this within 25 years. Amid presence of thousands of well-wishers, he was buried on the premises of Dr VRK Medical College. Now the onus is on his sons to take the group forward and carry on the work initiated by their father. One hopes that more Indians would realise the need for spreading education and set up schools, colleges and institutes for all sections of society, including Muslims. Assembly Elections in Madhya Pradesh: Will BJP win again or Congress make a comeback after a decade? The Bharatiya Janata Party [BJP] has completed two terms as ruling party in Madhya Pradesh. With Assembly elections round the corner, there are speculations whether the party would win the state election for the third time in succession or will the electorate choose Congress a decade. Till a few months back, the feeling in Madhya Pradesh, was that Congress didn't have much chance. 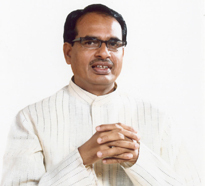 It was commonly said that Chief Minister Shivraj Singh Chouhan's image would help the party win the election with ease. But with leaders now crisscrossing the state and political parties conducting their own in-house surveys, it has dawned upon the BJP that the situation is quite different. In urban centres, it was believed that Congress doesn't have a face in the State. 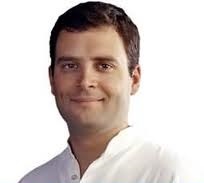 However, now it seems that the Congress is not only in the race, but it may be tough for the BJP to retain the power. The ruling party's ministers who were ensconced in their comfortable bungalows, had to again take the dusty routes in rural MP, when they felt that the polls are due soon. Then, they found that the BJP is not too comfortably placed. Except CM's image of a humble man, they don't have much to speak for in terms of achievement. While poor electricity is major issue in rural parts, other schemes haven't been implemented efficiently. Investment and jobs were promised but not much happened on the ground. The party has now realised it, although its quite late. Worse, there is strong resentment against the MLAs and the Ministers. For this, the BJP needs to change a lot of candidates, which is also difficult. The reason is that legislators when denied the ticket, play spoilsport for the party. The Congress was a divided house till recently. But with Ajay Singh [late Arjun Singh's son], Kantilal Bhuria, Kamal Nath and Digvijay Singh, putting up a joint front, and Jyotiraditya Scindia being pitted as as CM candidate, the party workers seem more confident. 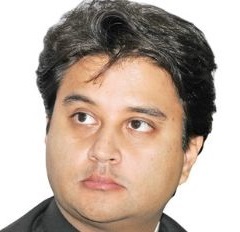 Scindia does have an influence in Gwalior-Chambal region. The stampede at the Ratangarh temple has also been used by the opposition to fuel public anger against the BJP. 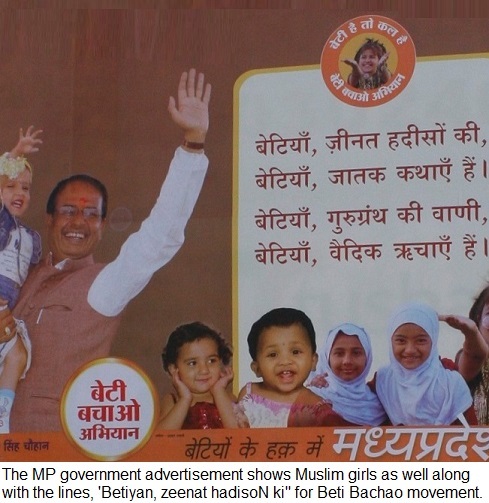 For the BJP, it has CM's image and his pet-schemes like 'Ladli Laxmi', which especially target women voters. Definitely, there is huge corruption and recent scams have hit the party hard. To state BJP's credit, there have been few communal clashes. Chouhan has lot of goodwill among electorate but will he be able to counter two terms of incumbency? That's the question. MP is a state where the third force has little presence. Once, Phool Singh Baraiya, had turned the BSP into a major force here. But Mayawati's strange decision to expel him, hit the party here. The SP has no strong base here except in areas bordering UP. The Gondwana Gantantra Party (GGP) looks resurgent. But it has presence only the tribal dominated seats. 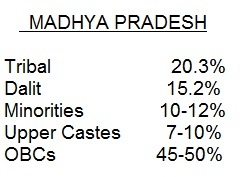 Madhya Pradesh is among the states with the largest tribal population in the country. It also has a sizable Dalit populace. Besides, the state has nearly 45-50% OBCs. But unlike UP, the politics is not caste-oriented. Chouhan, who belongs to Kirar, an OBC caste, has acceptability among almost all sections. The reason is his moderate image, which he has cultivated with effort. An alumnus of the historic Hamidia College in Bhopal, he has also kept promises like construction of Haj House. In Ladli Laxmi scheme, 'nikaah's are also held at state expense, just like Hindu couple's marriages. Besides, in Senior Citizens' pilgrimage scheme also, Muslims have been included and the elderly sent free of cost, to Ajmer on a regular basis, just like Hindus are going to famous shrines across the country. It is not that BJP here is totally secularised. In fact, RSS agenda keeps coming to fore time and again. Still, the party has kept the lumpen elements at bay. In 2003, BJP had won with a landslide majority. There was visible public anger among citizens as Congress government had failed to even repair the roads in the State. The roads in MP had become a joke nationwide under Digvijay Singh's regime. Uma Bharti was the first chief minister after BJP formed the government. But after a Hubli court warrant, Babulal Gaur became the CM for a short term. Since then, Shivraj Singh Chouhan has been at the helm. In 2008 election, the party won under his leadership here. Now if the BJP wins for the third time, it will also increase his stature in the BJP, as well as strengthening his kind of 'inclusive politics'. As elections are drawing nearer, it's clear that we are all going to witness a close contest in MP.